2018 will be our seventh year to offer a summer permaculture internship. This year we continuing our collaboration with 21 Acres, a center for sustainable living. This has been a wonderful collaboration between our garden team, the greater community, and young people looking for a way to get their hands dirty implementing permaculture principles in the real world. If you are interesting in applying for this year's internship, send an e-mail to our Garden Steward. To learn more about what our internship is like, check out the garden blog where our interns have posted their reflections. Newly laid out keyhole garden paths. Each year we attend the Northwest Permaculture Convergence. At the conclusion of the convergence in 2010 we gathered in small groups by location. There we found wonderful colleagues committed to permaculture who lived nearby. Out of that meeting was formed the Sno-Isle Permaculture Network (SIPN). Which has since been renamed Permaculture Woodinville. This has been one of the most delightful and nurturing connections. In 2015 we began to meet the first Tuesday of each month at 21 Acres. 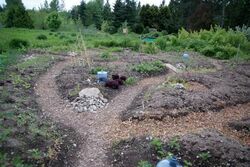 To find out about the many permaculture related programs offered there, you can join the Permaculture Woodinville Meet-up group. ​The garden began as a small organic garden plot more than 25 years ago and has evolved into an important focus of our work towards sustainable community. 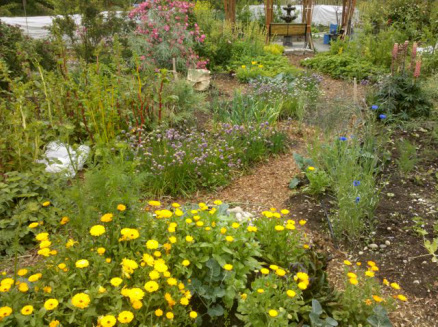 In 2010 the Biogaians took a field trip to the Bullock Family Permaculture Homestead on Orcas Island and started to orient our garden development along Permaculture lines. We established the PIGs (Permaculture Intention Group), began shifting our orchard plantings into food forests and studying and applying permaculture principles as much as possible.